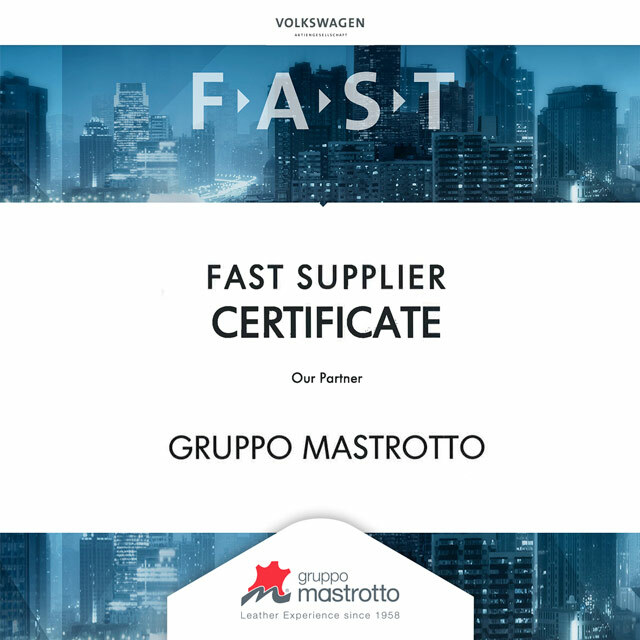 We are very proud to announce that Gruppo Mastrotto received the FAST Supplier certificate by Volkswagen Group at the presence of all the top management brands part of the Group. The German company has a goal for the future: to engage itself in a strategic and technological dialogue that is more immediate and intense with those supplier that ensure excellent and affordable best practices. Gruppo Mastrotto as a reliable partner, able to follow the customer in the innovation process and at the same time able to offer new development solutions, has been included in the strategic suppliers list. “Future Automotive Supply Tracks” (FAST), the initiative organized by the German industrial group, coincides with the clear desire of the Volkswagen Group to intensify its relations with its worldwide suppliers, involving all its own brands: Audi, Porsche, Bentley, Lamborghini, Skoda, Seat and Bugatti, to shape the transformation of the automotive industry and its strongest partners including Gruppo Mastrotto that has passed the rigorous selection and will therefore have privileged access to top decision-makers of the German group. This will allow all parties to implement innovations more efficiently and, above all, faster. Volkswagen Group has engaged itself to have a privileged relationship with Gruppo Mastrotto sharing strategies and business plans of medium and long term and making it an integral part of the strategy with regars to hides, innovation and globalization, thus giving access to confidential information not available to other providers, in order to increase its competitive advantage. The seven fundamental principles of Volkswagen Group: future, innovation, globalization, transparency, commitment, dialogue, promptness are the same carried out by Gruppo Mastrotto since 1958.